Ready to taste delicious Tokaji wine? 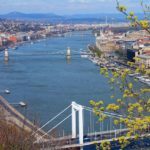 Here, Marilyn Eickenhorst shares the best places to do so in Hungary! When I am not working or traveling, I golf, read, or spend time with Charlie. I live in Texas. I thought Hungary would be an extremely interesting country to visit, having emerged from Communism only a relatively short time ago in 1989. Budapest looked like a beautiful, thriving city, and the Tokaji wines are rated as some of the best sweet wines in the world. Being a wine lover, I wouldn’t miss a chance to taste the Tokaji wines, including older, special vintages, with the winemakers themselves. I was in Hungary for four days. I spent a day in the Tokaj wine region, a day in Budapest, which included a culinary walk and a private motor boat cruise along the Danube, and two days traveling the countryside of Hungary, which included visiting the wine regions of Etyek, Sopron and Pannonhalma. In all of my winery visits, I met with the owners and/or winemakers, and tasted some great wines. The highlights of the trip included our visit to the Tokaj wine region, tasting of old, special Tokaji wines dating back to 1956, and our private motor boat evening cruise along the Danube. There were no disappointments. I shouldn’t have arranged and paid to taste every Tokaji wine that the wineries produced! There was way too much wine. The Four Seasons Gresham Palace in Budapest is a beautiful hotel with a great location, and the staff is very helpful. The Tasting Table in Budapest was where I tasted the old, special Tokaji wines. Gabor, the owner of the Tasting Table, arranged the tasting of seven Tokaji wines dating back to 1956, which were accompanied by charcuterie, cheeses and foie gras. The tasting was fantastic! I also had a great lunch in the Hungarian countryside at Viator Restaurant, located in Pannonhalma. The people of Hungary are welcoming and friendly. The highway system is modern and toll-free, allowing easy travel outside of Budapest. There are many sites to see in Budapest, and it is easy to get around. Follow Marilyn’s travels on her blog, Wine Travel Around The World.